Hey there! Well, I’m back. I know…long time, no see. I didn’t plan on being away for so long, but we got busy with this house buying stuff and getting settled in our new city, so I decided that, instead of posting just to post, I’d wait until I had something worthwhile to share after we closed on the house. It’s a done deal and she’s all ours! We finally closed last week but our lease on the apartment doesn’t end until July 1, so we’ve been spending our time cleaning, packing up the apartment and doing a few small projects before we move at the end of June. Oh, and there was the little spill I took down the deck stairs last weekend. Instead of packing and working on the house, we spent half the night in the emergency room. I hurt my foot and I’m pretty bruised and battered, but I’ll be ok. It could have been so much worse. It’s not an ideal time to be sidelined with an injured foot but what are you going to do…right? Anyway, since we don’t have any projects to share just yet, it’s the perfect time to bring you in and give you a tour of our new digs. 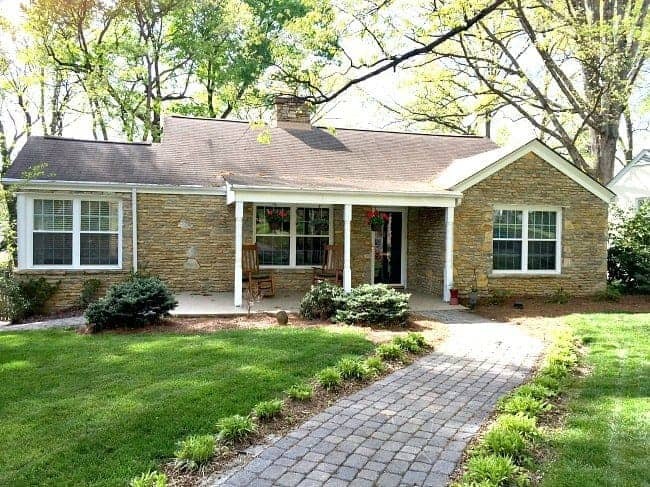 Our little stone cottage was built in 1946 and has 3 bedrooms and 1 bathroom in almost 1400 square feet, just a bit bigger than our house in Illinois. There’s a basement with a garage (the hubs is giddy with excitement) and a beautiful lot with tons of room for Finn to run around. Oh, and did I mention that I have a covered front porch? The biggest front porch I’ve ever had, and I can’t wait to decorate it. I’ll show you the rest of the outside another time. Let’s go in and have a look around. Coming in through the front door you see the living room. 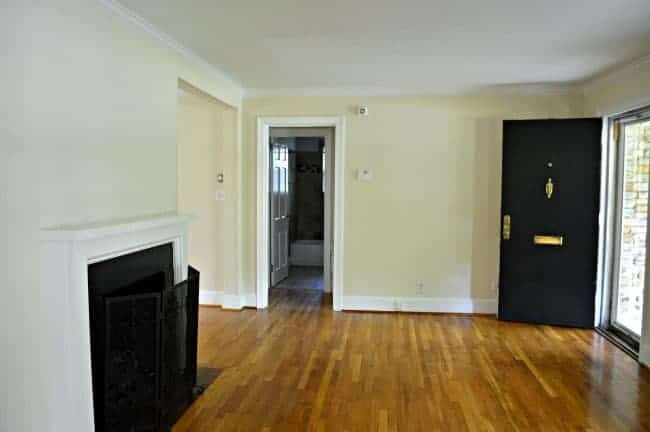 It’s not a huge room, and it’ll be a challenge placing our furniture, but it does have a fireplace. From the living room, you walk into one of the guest bedrooms. 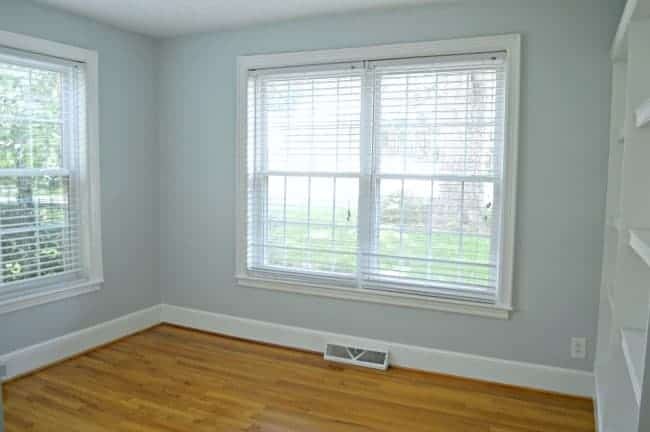 It has tons of light and an original casement window with a built-in seat. Bed placement will be a challenge in here but it’s such a great room. On the other side of the house we have the master bedroom, bathroom, and another guest bedroom. 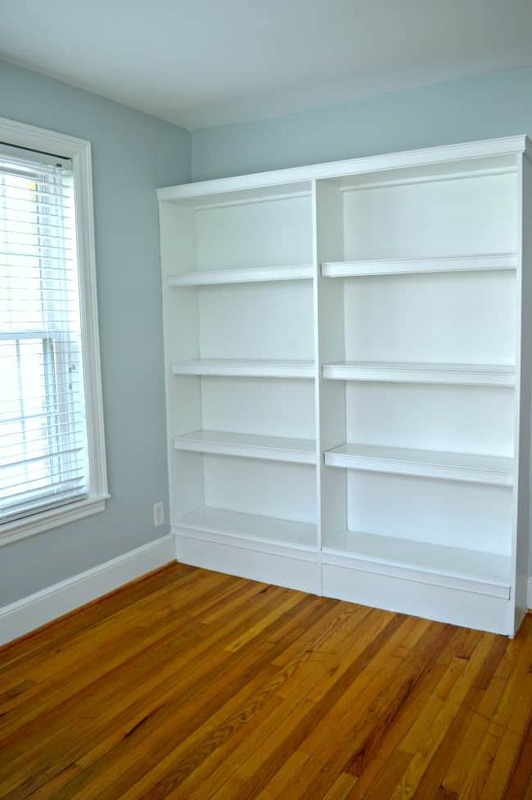 The blue guest bedroom has the biggest closet in the whole house (there are only 3) and it has a bookcase. The bookcase isn’t made very well and takes up valuable real estate so it will have to go. After living with 1 bedroom in our Illinois house, we swore we would never do it again but here we are…1 small bathroom. It was recently redone but I have big plans to redo it again to fit the era of the house. 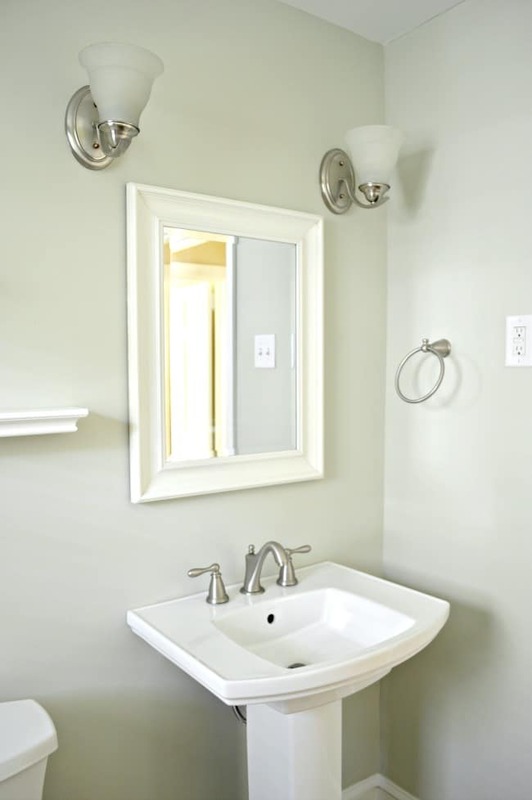 The first thing that we’ll do is install a new vanity so that we have a little extra storage. The master bedroom is in the back of the house, overlooking the backyard. It’s small but I think we can fit the necessities. This room is the first on the to-do list. Very soon it will have new paint, window treatments and ceiling fixture. Back out to the living room and we’ll head into the kitchen and dining room, aka our favorite space in the house. We have plans to redo this space, too. The cabinets are old and not the best quality so they will go, along with the countertops. It’s ok for now but eventually, we’ll redo it all. 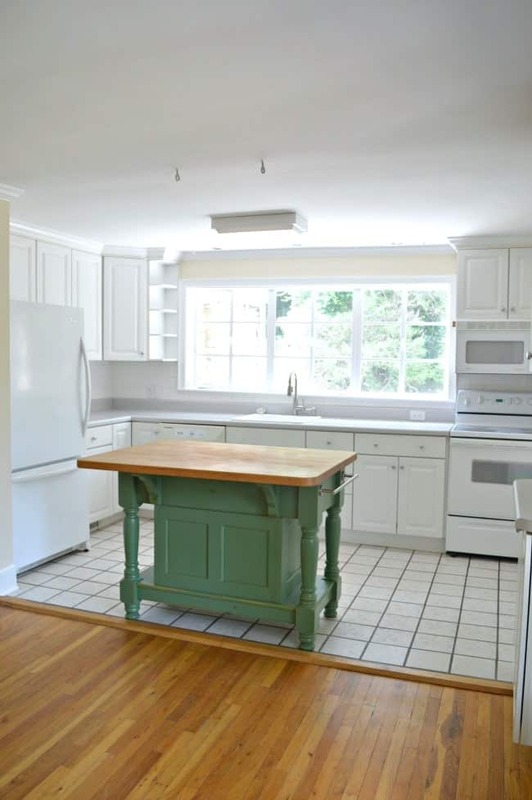 For now, though, we’re going to replace the stove and dishwasher. We’ll be having gas hooked up to the house so the electric stove will be replaced with a new gas stove (again, the hubs is giddy with excitement). It’s the little things with him. 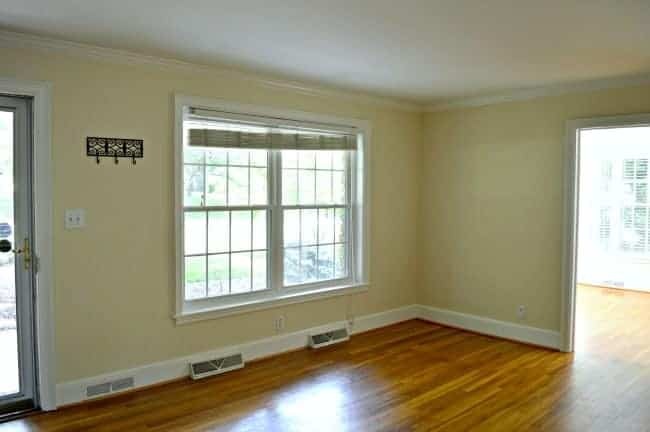 I love the two original casement windows in this room. 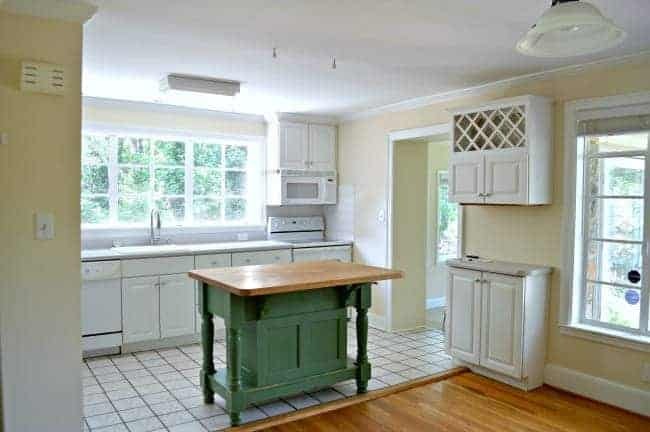 The one over the sink looks out onto a wooded lot next door and the one in the dining area looks out over the backyard. We are in the city but can’t see any of our neighbors. Love that! In our Illinois house, our dining area was in the living room. It’ll be nice to eat and not look at the tv. 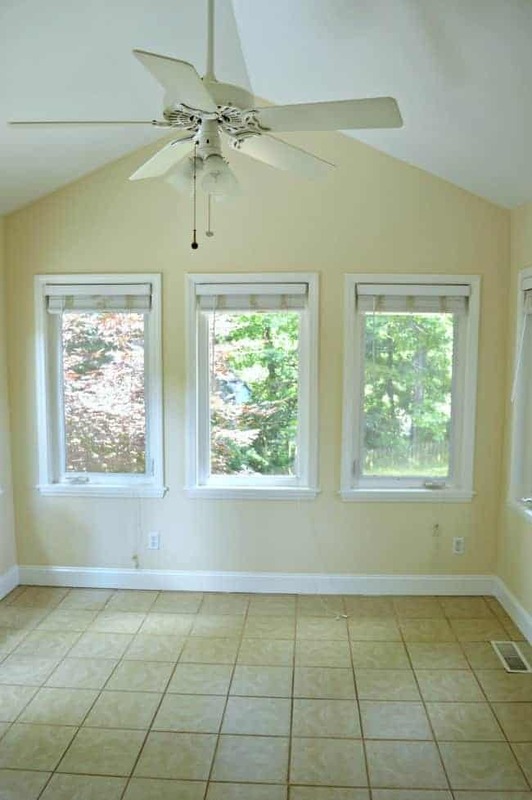 The last room, which is off of the kitchen, is the sunroom. It was added on several years ago and, although it’s pretty, it doesn’t really fit with the style of the rest of the house. We have big plans for this room but I’m running long, so I’ll share all the details another time. 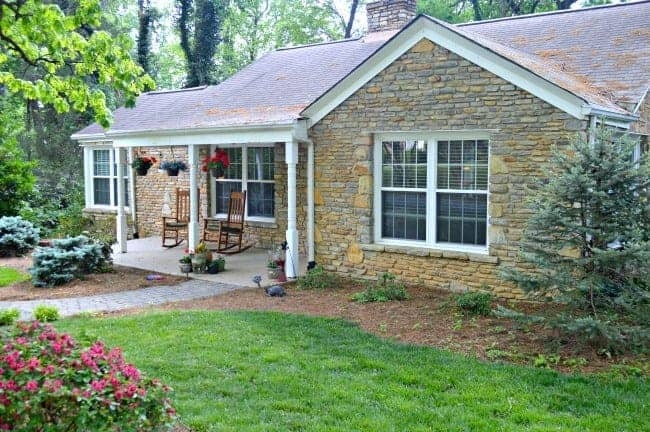 There you have it…our little stone cottage. We have so much to do and our heads are spinning, but we’re excited about this next chapter. Stay tuned for all of our projects, which will resume the minute my foot heals. You can read the strange but true story about how we found our new house, here. Love your new home! I LOVE that bank of windows over the sink! That’s the one thing I wish I had! (That and an island!) Outstanding home!! Congrats! SO sorry about your spill / hope it all feels better soon. Meanwhile I enjoyed the tour / the house is just darling! Thanks, Deb. I’m slowly healing and itching to get started. So glad you stopped in for the tour. I love the kitchen too! Your right about those windows, so pretty! The whole house. 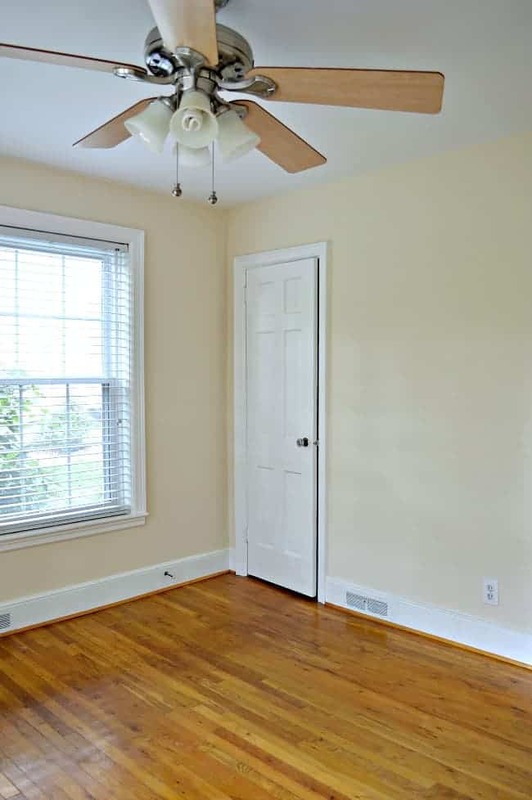 inside and out is pretty, and knowing you, this home will be gorgeous in no time! I can’t wait to see the process and get the reveals of any of your rooms soon!!!!! So happy for you! Thanks, Vel, I really appreciate it!!! Now the real work begins but we are up to the challenge and absolutely thrilled with our choice. It is going to be fun, Nancy. It’s just so overwhelming when you first begin. I’ve done this so many times that you’d think I would understand that, but nope. It still gets me every time. Thanks so much for stopping in, Nancy, and taking the tour. I’m sorry you had a spill! Not a great way to welcome you to the neighborhood! Love your new home and I know you’re going to have so much fun fixing it up. Not sure I could live with one bathroom but our next door neighbors have 2 kids and they have the same and make it work! I’m so sorry you got sidelined! I love the stone on the house, and those pretty hardwood floors. I have to say, that little wooden part that sticks up by the island? I’d trip over that first thing. I am really loving the stone on your new home. Just lovely. Not going to lie, I loved your other home also. You will make this home just as special, if not more so. 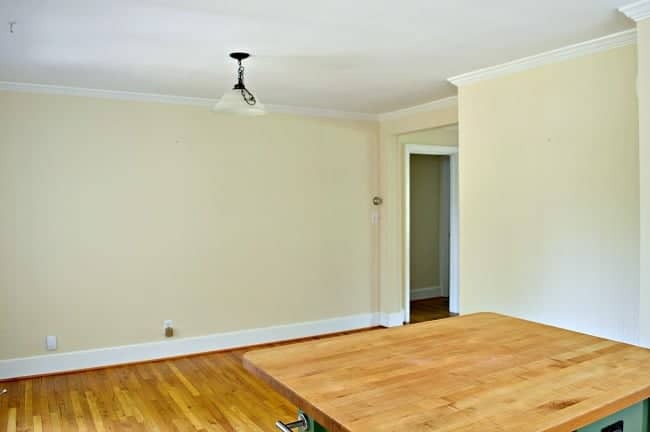 I love your blog cause you really showed me and made me consider the plank ceiling I want to do. You were kind enough to email me back and tell me where you bought your boards. I really appreciated it. I may not be able to do it right now but I know where to come to see how it was done right. Take care and can not wait to see what you do in your new home. Awww, what a sweet comment. Thanks so much, Tracy. I loved my old home too and as I look around at all we have to do, I miss it terribly. I know that we’ll get there. It just takes time. I’m so glad that I was able to help you with the planks. Projects take time so when you do yours, I would love to see the results. Thanks for stopping in and checking out our new house. Garage and a basement and a sunroom?!?! 😀 The house looks lovely, and like a great building block for you to work your magic on! 😀 I hope your foot heals up quickly and doesn’t cause too much trouble for your move! I’m back again! Been busy with so many things, some good, some not so good. We’ll talk about it some other time. Love your new home! I love that cottage look, it’s so homey to me. Can’t wait to see what you do with it! Hi, MJ, it’s so great to hear from you. So glad that you stopped in. Best wishes to you, my friend. Oh no!! I hope that foot heals quickly so you can dig into DIY again super fast!! The house is charming and super bright! The windows in the kitchen are my favorite. I can see why that room is your favorite, too! Congratulations my friend and let the renovations begin!! Cheers! So sorry to hear about your accident. I just love your new house, especially the front porch! I am excited to see the transformation. My house hunt has been put on hold for awhile. The pickins are slim in the area I want to be in right now. I thought I had found the one but once inside it needed way more work than I could handle on my own, not to mention more funds than I have. I hope your foot heals quickly. If you are like me you will go nuts having to slow down. I’m so sorry that your house hunt has stalled. I just know that you’ll find your perfect match. Hang in there. Thanks for dropping in today and filling me in on your house search. Adorable little place. What fun it will be to make it your style. Such a pretty house. 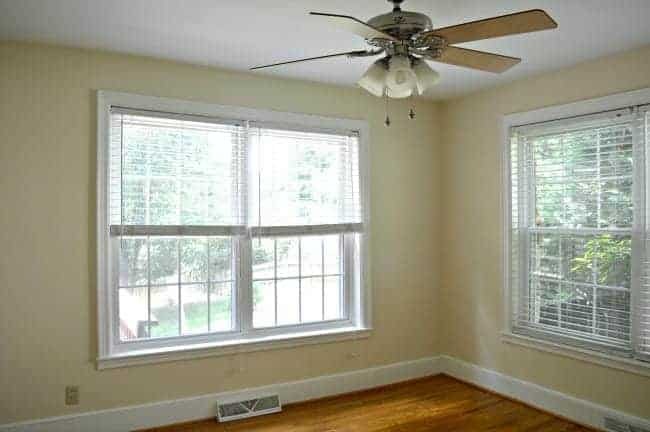 I love all the large windows! The windows are my favorite feature. Thanks so much, Angie! So charming. I love it all. Cant wait to see how you decorate. ❤️ It. Thank you, Phyllis. I’m dying to get to the decorating part. Hopefully soon. 😉 Hope all is well by you. Such a charming home! The kitchen is my favorite space. However, after you work your magic I know it’ll be hard to pick a favorite. Looking forward to see how you transform it! I love your new house sooooo much. I’m partial to small homes that flow well and it appears that your does. It seems well taken care of with mostly cosmetic updates. I even like the island, although not the green color so much. 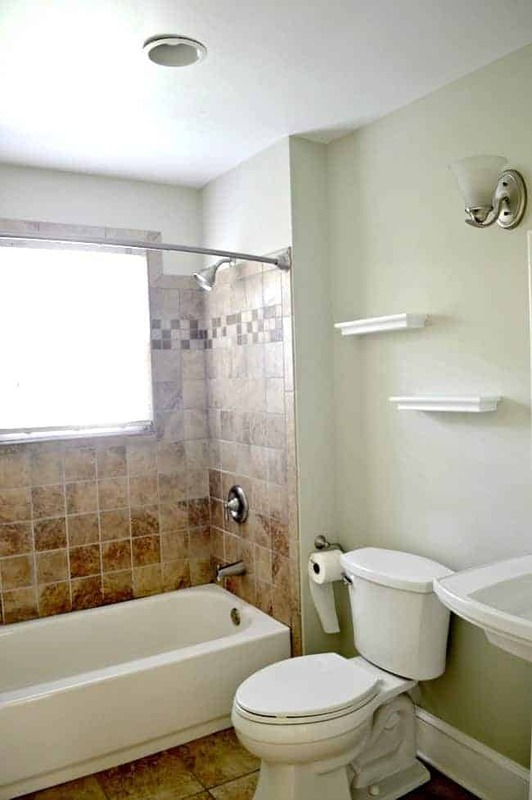 One bathroom can be a problem, I know from experience, but if your schedules are any different at all, it’s workable. 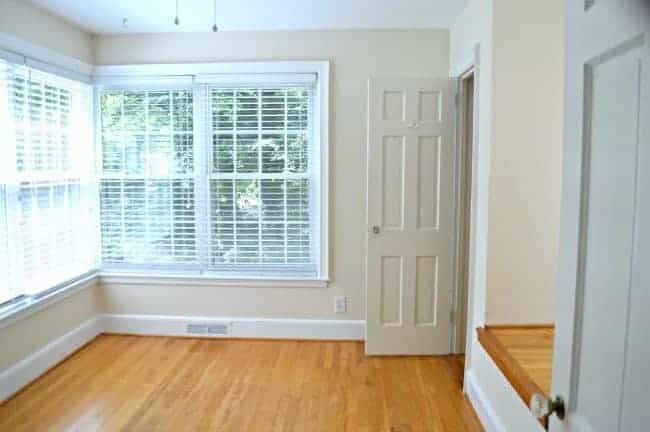 The beautiful windows and floors are certainly a good start to a beautiful place to call home. Get well soon so you can get started. Thanks so much, Pat. We didn’t expect to get something this small, or with only one bath, but I think we can make it into a home we will love for years to come. Thanks for the well wishes, I appreciate it. It’s so good to have you back! I installed Windows 10 and lost a lot of “stuff” including Chatfield. So here I am again ready and waiting for the next installment to begin, and may I say I love your little cottage and can’t wait to see what “we” are going to do with it. Sorry about your accident, but I know you will be back with paint, hammer and nails soon. Thanks, Brenda, it’s great to be back. So glad that you found me again. 😉 We are so excited to get to work, and there’s definitely a ton of things to do. Thanks for stopping in, I truly appreciate it. Welcome to North Carolina – you’re going to love it here! I moved here (Charlotte) from St. Charles, IL many moons ago and don’t think I’d move back north for any amount of love nor money! Can’t wait to see what you do with your little stone charmer. This is going to be fun! Thanks, Susan! We are loving North Carolina and ready to get to work. Thanks for stopping in. Such a sweet house and I know you will have fun making it yours. Looking forward to updates. Thanks, Kim! We’re looking forward to making it our own.